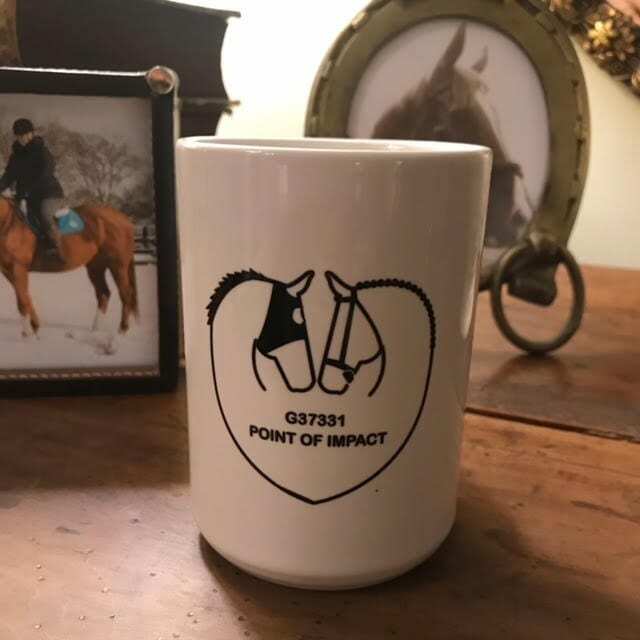 "I love the reflection of the racehorse meets show horse on this mug from OTTB Outfitters," said Rebecca Larson, who ordered the mug customized with her retired racehorse-turned-dressage horse's tattoo number and racing name. With the holiday season ramping up, 'tis the season for gift-giving! It can be tough to find the right gift for a horse person (especially if the one doing the shopping isn't equine-inclined). If one (or several) of the people you're shopping for ride, lease, take lessons on, or just plain love off-track Thoroughbreds, we've got your gift guide at the ready. There are many worthy charities related to off-track Thoroughbreds. If the person you're shopping for got their horse from an equine adoption organization, consider making a donation in their honor (or their horse's honor) to that aftercare facility. Many aftercare organizations also sell merchandise, including apparel, saddle pads, jewelry and more, with proceeds benefitting the organization, so a gift of a branded saddle pad, shirt or hat, along with a note that a donation has been made in their name, could make for a very meaningful gift. If their horses didn't come from an aftercare organization (or if you just have no idea where in the world their horse came from), you can search the Thoroughbred Aftercare Alliance's list of accredited aftercare organizations to find one in the potential gift recipient's geographic area (or, you can make a donation to the TAA directly to be used where it's needed most). You can also make a donation to Old Friends, which cares for pensioned stallions and other famous (and not-so-famous) Thoroughbreds in their twilight years. Or, you can always just Google “Thoroughbred adoption” and the city or state in which they reside to find some of the aftercare organizations in their area. You can also choose to donate to an organization that focuses on promoting Thoroughbreds as riding and competition horses. For example, the Retired Racehorse Project, which puts on off-track Thoroughbred demonstrations and seminars at equine expos around the country and hosts the annual Thoroughbred Makeover, is a membership-based non-profit organization. Members receive the organization's Off-Track Thoroughbred Magazine, discounts on apparel and other logo merchandise, discounted tickets to their events and more. Another option for those interested in promoting off-track Thoroughbreds as sport horses is to make a donation to the TAKE2 Program, which sponsors Thoroughbred-only classes at hunter/jumper shows. Alternatively, you can also contact the Thoroughbred Incentive Program at The Jockey Club about sponsoring a Thoroughbred-only class at a show in your area in honor of your favorite Thoroughbred lover (or in honor of their favorite Thoroughbred!). The research route is also a good option for gifting a donation, especially for those who have a career, or are aspiring to one day have a career in equine healthcare. The Grayson-Jockey Club Research Foundation funds veterinary research at the university level. If they or their loved ones were affected by the natural disasters this year, you may also consider making a gift to one of the organizations still working on behalf of hurricane, wildfire, etc. victims. Some reputable organizations include the U. S. Equestrian's Disaster Relief Fund, Caribbean Thoroughbred Aftercare, Thoroughbred Charities of America or RanchAid (the FEMA-appointed organization that deals with large animal agricultural recovery efforts). A donation is always a meaningful way to show someone that you not only care about them, but also what they are passionate about. For those who own or ride off-track Thoroughbreds, there's a certain pride that comes with knowing their horse was purpose-bred to be an elite equine athlete and likely has some of the world's most recognizable bloodlines running through his or her veins. Your potential gift recipient has likely invested a serious amount of time, energy and emotion into helping their Thoroughbred re-direct its athletic abilities from racing to a different sport, so why not celebrate their hard work and their equine BFF with a gift tailored to them? Etsy, an online e-commerce community of “shops” specializing in handmade, small batch or otherwise unique items, is a great place to shop for creative gifts for any occasion or specialty, and when it comes to Thoroughbreds, there are loads of options from which to choose. Just type in “Thoroughbred” or “OTTB” in the search function and you'll get thousands of options, many of which allow you to personalize the gift with the horse's racing name or tattoo number. Barnandbay – Customized “bistro-style” mug that features a horse's tattoo number, Jockey Club-registered name and barn name/nickname. ThePlaidPaddock – Order a custom saddle pad that features the gift recipient's favorite colors; can be further customized with a graphic of a racehorse (or other equestrian discipline, like dressage or jumping horse), name/tattoo number of horse, name of recipient, or anything else you can come up with! BitofBlingEquestrian – Custom polo wraps can be purchased in any color and embroidered with “OTTB” or with the gift recipient's initials, horse's name/tattoo number, etc. There are also a number of Thoroughbred-related Facebook stores offering trendy OTTB apparel and merchandise. OTTB Outfitters is one that has clever designs on t-shirts and coffee mugs. Another option that may take a bit more digging on your part but will be well worth the effort is to track down and order a win picture from the racing days of your gift recipient's horse (if he or she was indeed a winner on the track). You can go to www.equibase.com and use the search function to look up the horse in question using their Jockey Club-registered racing name. Then, look at their career statistics to see if they had any wins. If they did, just click on the “results” tab to find out the exact date and race number of their win. With this information, you can then call the track photographer of the racetrack at which they won and request a photo (depending on how long ago the win was, they may or may not still have the win photo on file). There will be a nominal charge (typically $20-$35) to have it printed and shipped to you. As mentioned earlier, many Thoroughbred-related charities have merchandise available for purchase, with proceeds going to their organization. ReRun sells prints from their “Moneigh” series, which have been painted by famous horses. Other aftercare organizations, like the Secretariat Center, New Vocations, MidAtlantic Horse Rescue, Thoroughbred Retirement Foundation and others have online shops with logo apparel and merchandise. There is seemingly no end to the gift options for the Thoroughbred lover(s) in your life. If you have a good suggestion that we've not already covered or if you yourself sell OTTB/Thoroughbred-related items privately, please share it in the comments section. Happy holidays and merry gifting! This entry was posted in Aftercare Spotlight, Horse Care, NL List and tagged Aftercare Spotlight, Cosequin Presents Aftercare Spotlight, Jen Roytz, Off Track Thoroughbreds, OTTB, OTTB gifts, Thoroughbred aftercare, Thoroughbred gifts, thoroughbred retirement by Jen Roytz. Bookmark the permalink.